So my flat is in a split terraced house, and somehow both gas meters ended in the neighbours flat (I have the dubious pleasure of having both electricity meters). I'm moving out soon, so I need to submit the final readings to the gas company, but my neighbours are moving out tomorrow, so I won't be able to just pop in to check the readings. The landlord will check the meters anyway, so it's not a big deal, but hey, why should I trust him? You can see quite clearly when the winter started getting cold, when I was away for Christmas, or when I just got lazy and have not taken readings as often. I hear that the police uses electricity consumption to locate weed plantations. 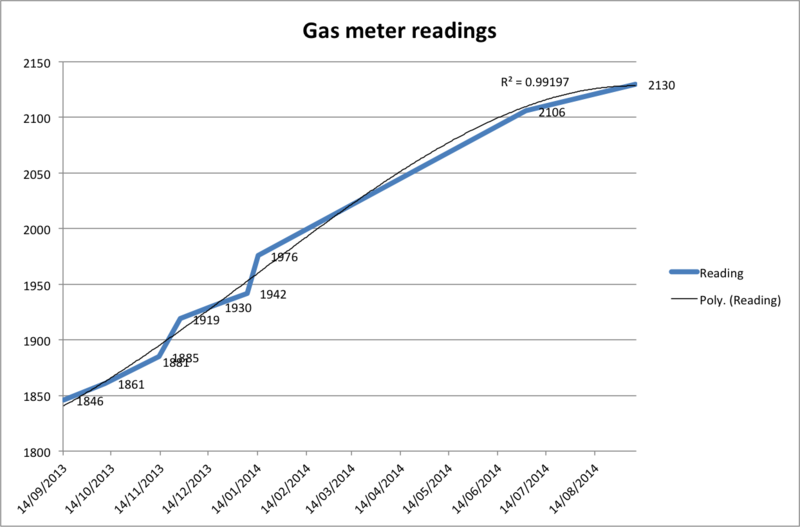 Does the BBC use gas consumption to find people for the Great British Bake Off? Anyway, assuming a linear interpolation between the previous meter reading in July and when I move out, I shall use about 1.75 cubic feet extra on top of today's meter reading. I doubt the utility companies use anything fancier to predict their bills, though they usually err on the side of more consumption. Let's see how far off I'll be.